Over the last several decades, hockey teams have undergone a variety of changes. From the way that professional hockey teams are assembled nowadays to the way that those teams play on the ice, the game of hockey simply has a different look and feel to it in the modern day. While the style of play in the NHL and other professional leagues across North America and Canada has certainly changed, that hasn’t been the only thing to transform with the times. While the pace of play in the NHL has become drastically different over the last several years, team uniforms have also been tweaked over the last few decades in order to cater to newer and sleeker designs, colors, and striping patterns. Despite the fact that some older jerseys might be gone, that doesn’t mean that hockey fans should forget about certain uniforms – especially since many of the best old school uniforms have come from teams that are still in existence to this day. Black, grey, and white might be more recognizable to modern day Kings’ fans, but back in the late 60s, 70s, & 80s the regal color scheme of purple and yellow reigned supreme for Los Angeles. 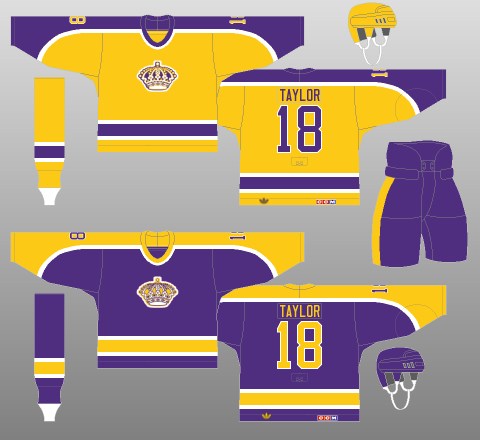 Not only did the Kings’ home and away sweaters employ different colors during the mid-to-late twentieth century, the logo was also different as the King’s crown was the only object featured in the center of the jersey. Even though the Kings’ jerseys didn’t change much in terms of design between the late 60s and 80s, the additional white striping on the home and away uniforms made a subtle, yet eye-catching, difference on Los Angeles’ long-time color scheme and striping pattern. 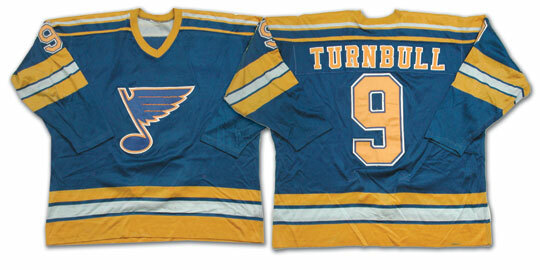 Many might look at this selection and wonder why it was included, but it’s hard to look at this jersey and not think of the Chiefs’ jerseys in the hockey classic “Slapshot.” The Blues’ center logo may be a bit unrefined by conventional standards in these jerseys, but much like the Kings’ 1980s sweaters, St. Louis’ addition of a single stripe (shoulder/neck region) adds a nice element to this design. The jerseys worn by the Winnipeg Jets throughout the 1980s were unmistakable, and these designs fired on all cylinders. While the original Winnipeg Jets of the NHL ultimately became the Phoenix/Arizona Coyotes, the return of hockey to True North in 2011 made the inclusion of these sweaters a much easier decision. 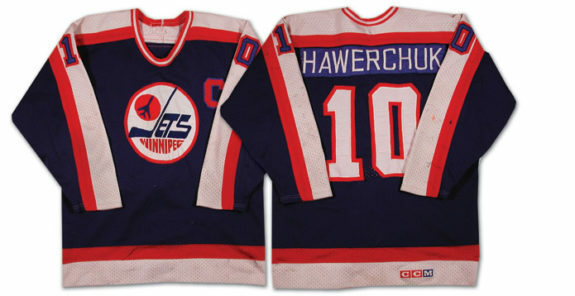 Not only does the Jets’ jersey use bold colors to draw attention to the logo (which features a jet and the team and city name), the red and white stripes on the shoulder, arm, and waist area make this a stand-out jersey in any hockey venue. If these jerseys somewhat remind you of the Penguins’ Winter Classic (2011-2013) sweater, then there might be a good reason. While the central logo for the above jersey is different from the design on Pittsburgh’s current Winter Classic sweaters, the two shades of blue mixed with the white striping patterns gives this jersey a very discernible look. Combine the coloring and striping patterns with a logo that draws one’s eye to the center of the jersey and you have a sweater that functions well on many levels. If you’re a fan of old school hockey jerseys, then I see no way that any individual should not like these uniforms that the Canucks started using in the mid-1980s. 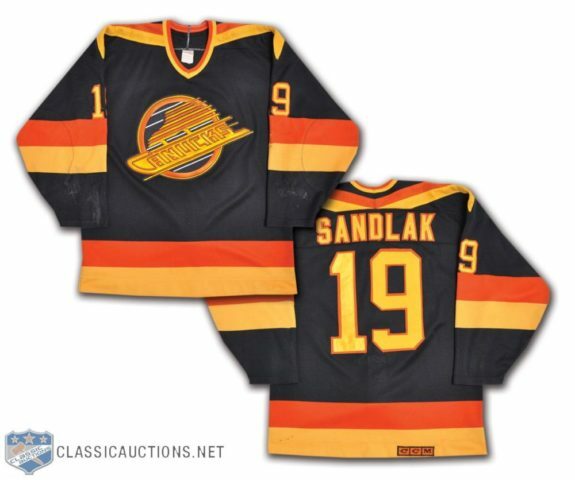 The orange and yellow striping followed previous designs that Canucks jerseys employed (albeit not styled in the “V” format), but the biggest change with these sweaters is in the center as the team’s name is encapsulated in the blade portion of a hockey skate which is contained within the circular logo. The use of colors such as black, orange, and yellow really makes this jersey stand out, and hockey fans old enough to remember this design would easily recognize this sweater in a crowd. 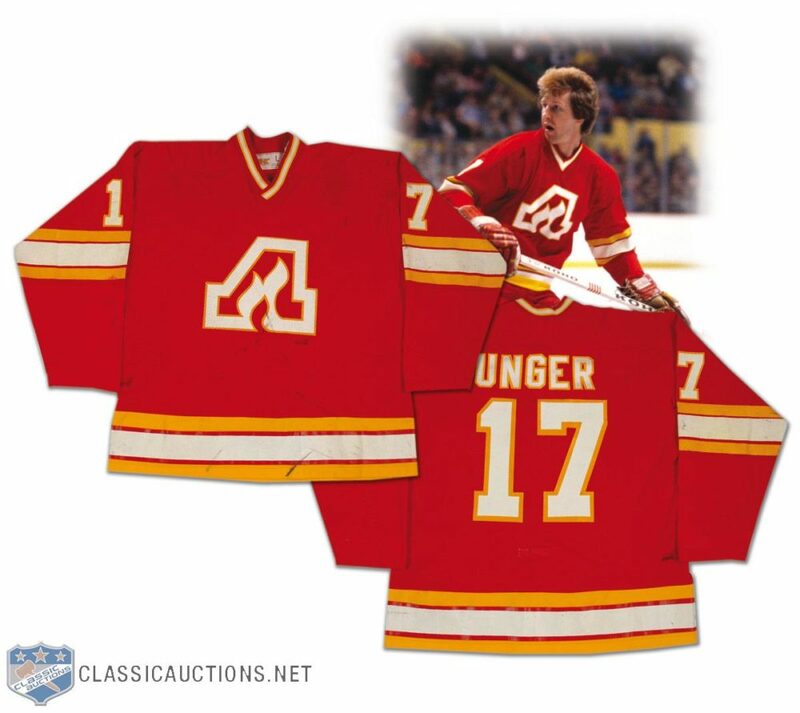 Despite the fact that the Atlanta Flames relocated and became the Calgary Flames, it would be somewhat of an injustice to omit the team’s jersey from such a list. Unlike Calgary’s current jerseys – which feature an externally flaming letter “C” – Atlanta’s sweater centered on an internally flaming letter “A.” Given the fact that the Calgary Flames chose, in large part, to retain Atlanta’s original jersey concept, this is an oldie that definitely deserved a shout out. 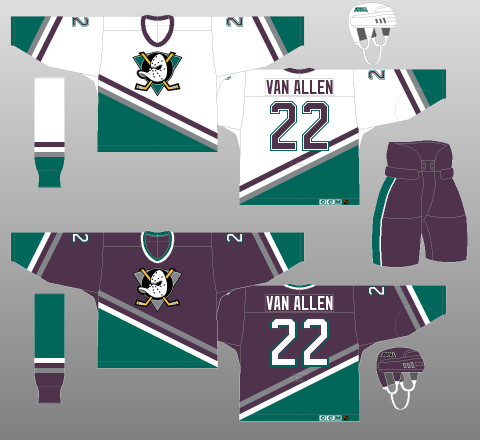 Anyone old enough to remember the Mighty Ducks of Anaheim certainly remembers their jerseys. Two hockey sticks crossed behind an old school goalie mask with a duckbill – how could one go wrong over here? Whether you prefer the purple or white colored jerseys, there really isn’t a wrong preference when picking a favorite Mighty Ducks jersey. Even if one isn’t a fan of the current Anaheim Ducks, anyone that grew up in the 1990s and watched any installment of the Mighty Ducks movie series will undoubtedly be hit with a blast of nostalgia when looking back at these jerseys. 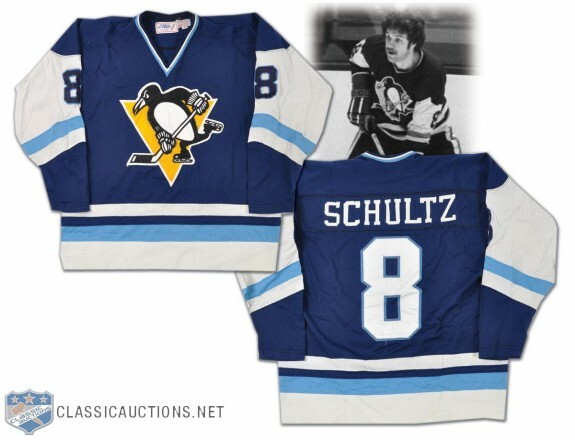 Be sure to check out NHL Uniform Database for all of your hockey uniform needs (past and present). Also, check out Classic Auctions for some excellent old school jerseys. Last, but not least, please check out uni-watch.com for news on all of your favorite sports jerseys.